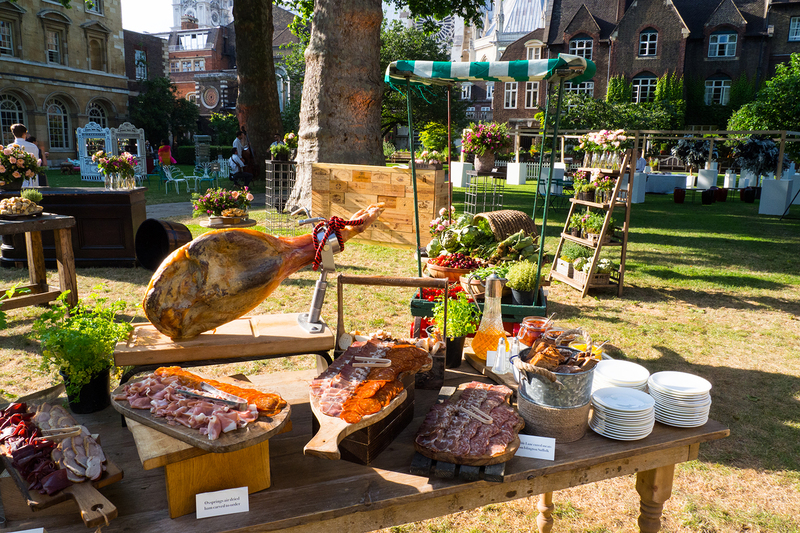 The amazingly creative Christopher Mills of The Events Mill came to us with a stunning creative deck for an inspirational 25th anniversary event in the College Gardens at Westminster Abbey. With only 3 weeks from the initial quote to the event delivery the Tonic team worked tirelessly to make The Events Mill’s catering designs and requirements for the evening a reality. The gardens were transformed into a pop-up town for one night only, and sectioned into different areas to represent a number of the client’s investment success stories over the years. There was a village store replete with beautiful British cured meats, hand crafted cheeses and bountiful seasonal produce; a pop up Asian-inspired restaurant serving the very best sushi and teppanyaki fresh from the grill; a modern interpretation of a sweet shop filled with our favourite sugary treats; a tourist information booth with London Underground themed jelly and a village square complete with an impressive bespoke-made tree hung with classic picnic goodies, next door to a sparkling water fountain. It’s fair to say that this was cutting edge event catering and we look forward to many more exciting events with The Events Mill in the future.